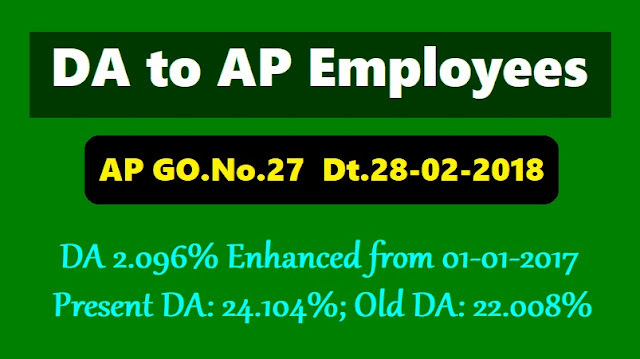 AP #GO.27, Present DA 24.104%, #DA enhanced from 22.008% of the basic pay to 24.104% of basic pay from 1st of January, 2017, AP GO.27, Dt.28-02-2018, DA enhanced from 22.008% to 24.104%, Arrears : 1st January 2017 to Febraury 28, 2018 to GPF, Cash from March, 2018, DA 2.096% enhanced from 22.008% to 24.104% from 1st of January, 2018. DA enhanced from 22.008% to 24.104%- #Present DA:24.104%: AP Government has sanctioned the Dearness Allowance (DA)(2.096%) to the employees of Government of Andhra Pradesh from 22.008% of the basic pay to 24.104% of basic pay from 1st of January, 2018. GPF Employees: 1st January 2017 to February 28, 2018 (14 Months). CPS Employees : 10% of DA Arrears from 1st January 2017 to February 28, 2018.
b. 90% Cash to CPS employees: from 1st January 2017 to February 28, 2018.